It's impossible to have 2 songs with the same code, every song has a different code, what are the requirements of the law in your country? Could you explain better? do you have a document to see as example? Portugal it's a bit different. But the conversion from csv to xml I might be able to do (with the help of programmers, if MBMusicReport does not work with XML). Attached to lists of codes for "Nationality", "Expression" and file XML. I was trying to simplify using the genres and other MBStudio infos already. is this list an international standard? as far as i know there is an ISO standard here: Country Code, ISO and Nationality gist.github.com/zspine/2365808 but it's different from yours. 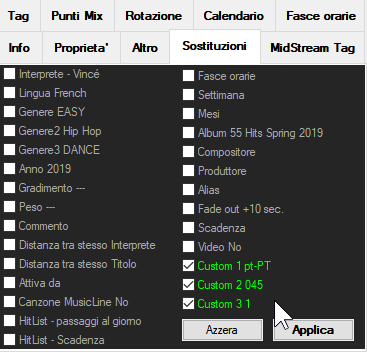 anyway i have an idea to solve this customization for you and for any ohter that need custom values in the songs. MB SOFT wrote: is this list an international standard? The List provided by the Regulatory Entity for Social Communication - ERC ( http://www.erc.pt/pt/fs/erc-in-english ) is not the one it refers to. The XML that I sent for example is from a Portuguese automation software - AVA ( https://www.avaplayer.com ). I'm waiting for news and thanks for everything. Today I learned that it is also possible to send by template in MS Exel in addition to XML. Here's the sample MS Exel template. Will the custom Alias be able to repeat in multiple files at the same time? Not to make file to file. Will the information appear in the list of MBStudio and MusicReport songs? Medeiros wrote: Will the custom Alias be able to repeat in multiple files at the same time? Not to make file to file. Last edit: 1 week 6 days ago by MB SOFT. Thank you very much. This will be very good for the radios that use the software in Portugal. I am waiting for the update of MbStudio with these functions.